Henry Fanshawe, the last family member of Fanshawes Commodities in the City of London, leads a quiet life trading spices in a large dealing room. His day consists of ignoring requests to tidy his desk, making money and spending it on his three great loves: French landscape paintings, fine wine, and cricket. But the new City does not agree with him, and he finds himself falsely accused of financial chicanery, and summarily dismissed. In a stroke of extremely good fortune, a legacy from an elderly aunt allows Henry to move to the Seychelles – though there are strings attached. He must manage her Village Cricket Club, and propel it through the formative years of the Seychelles Cricket league to the position of greatness it deserves. For his colourful and talented team of amateurs, who include a depressive ex-county opener, a drug-taking fast bowler, and the local Chief of Police, this would be difficult enough a task. But in addition there are darker forces within Seychelles cricket, forces from the murky world of gambling who wish to twist the beautiful game to their illicit ends. 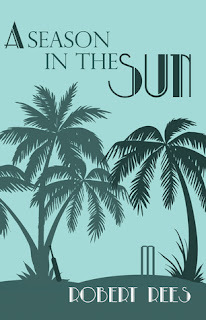 What a delightful read this book is, with something of a timeless feel: a light-hearted crime tale that combines some fun characters in an exotic place, with more than a spot or two of cricket. I wasn't quite sure what to think when I started the book, but found myself smiling throughout what turned into a one-sitting read. A lovely palate cleanser from some of the much darker and award-nominated crime tales I've been reading lately. There's a really pleasant 'lightness' to this book, even among some violence and nefarious deeds sprinkled throughout the cricket. In a way, Robert Rees has captured that sense of village cricket known throughout the British Commonwealth - a leisurely feel with moments of intense action, a sunny, summery vibe. Seriousness and hilarity (absurdity?) all rolled into one as eager amateurs battle it out on the field. Henry Fanshawe is a commodities broker on the spice desk for what was once a family business (now owned by 'the Americans'). In his fifties, he's well-liked by almost all of his colleagues. But not by all, and this proves his downfall: having cross swords repeatedly with the head of HR, Henry finds himself out on his ear, wrongly accused of skimming profits. His beloved wife having passed away years before, and now his longtime career hitting a brick wall, Henry isn't quite sure what to do. The clouds have a silver lining though, thanks to the unfortunate passing of Henry's eccentric aunt Esme, a colourful character who'd occasionally visited Henry in London, from her home in the Seychelles. Henry is bequeathed Aunt Esme's property and more, on the condition he continues what she's started with her local club, a village cricket club on the African island. Henry loves his cricket (he was a useful left arm spinner at lower levels), so is delighted by the unexpected opportunity, even as he struggles to adjust to tropical heat and different ways of doing things on the islands. 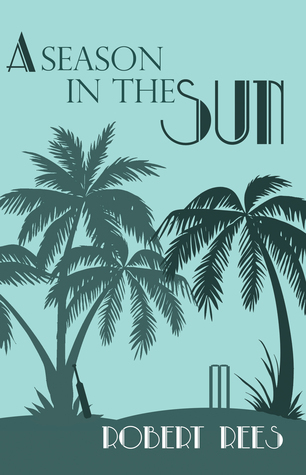 A Season in the Sun tracks the exploits of Henry and his colourful assortment of players as they battle for glory in the local cricket competition, up against other village teams and corporate clubs with the odd professional ring-in. A season that gets more complicated when some unusual results crop up, and the eyes of Indian betting syndicates seem to have turned their way to the competition. I grew up playing cricket for many summer seasons in New Zealand, and enjoyed the way Rees entwined the game with a fish-out-of-water tale that was part mystery, part farce. I think both fans of light-hearted mysteries and fellow cricket-lovers will enjoy A Season in the Sun (even if it could have used a stronger edit - there are a handful of inconsistencies in description or scoring in some of the games, eg a team being five down, losing two wickets , then only being six rather than seven down etc - this may not bother non-fans, but 'pings' for those who know the game). There is a fun cast of characters, from the pot-smoking fast bowler, the village reverend and his Catholic counterpart, to the mirrored-shades wearing Chief of Police wicketkeeper. The nefarious deeds of the betting syndicates provide some threat, but the tale always has a light-hearted feel. This is the kind of book that, like watching a lower-grade cricket game with a drink in hand on a summer evening, you can just sit back and enjoy for what it is, rather than thinking too much. Taking in the atmosphere, the mix of action and a leisurely vibe, curious about what might unfold from the players on the field but loving the experience more than desperately invested in a particular result. I wouldn't mind seeing another instalment in the cricketing adventures of Henry Fanshawe.